Habitat: Shrubbery and other arboreal-type locations, including around human habitation. We have quite a few Mediterranean geckos living on our house. Being nocturnal, the only time I see them during the day is when I surprise one in the garage. These lizards are fairly fragile and their tails readily detach (they grow back, but don't look nearly as nice as the original). Geckos are capable of vocalizing; at night you can sometimes hear the "smacking" sound Mediterranean geckos make. The individual pictured here is one of several I captured and housed for a few weeks Spring 2002 while our house was being repainted. Mediterranean geckos are not native to Texas (or anywhere else in the United States). They were introduced, most likely as stowaways on shipping vessels. They can be found in many locations in America now, and seem to favor buildings. 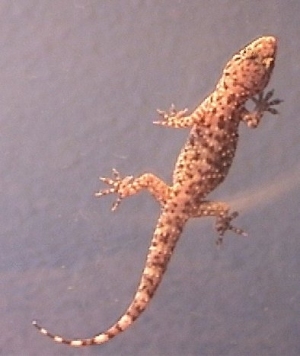 This is a picture of a baby gecko on my porch, taken with the aid of my NightShot function on my video camera.